You know the prestigious Duelund resistors, that are so much adored by Hiend-Audio audiophiles ? The ones for which they are willing to splash out like 15 USD a piece (add to this duties and transport costs) ? 9B, 8B, 7B, 6B, 5B, 4B, 3B, 2B, B, HB, H, 2H, 3H, 4H, 5H, 6H, 7H, 8H, 9H, 10H. As per resistance that we actually need, we choose a graphite rod of appropriate hardness. The soft ones are suitable for resulting low resistance (like single ohms). The hardest ones – for resistances that even reach up to 280 ~ 300 ohms. Take a cigarette lighter and heat up the ends of the rod with the flame, to burn out the fat and protective coating – but not too much, without exaggeration. Flame them for 10~15 seconds, or so, with a medium sized flame. When they cool down, wipe the endings off clean with a piece of paper towel. Take a small hobby vice and fix a drilling bit within it, one of a diameter of 2mm, clasping it “back to front”, i.e. so that the smooth cylindrical end protrudes to the “outside”. Take a copper, or silver coated copper, solid core wire, of a diameter of 0.8 mm and wrap it tightly around the drill bit. Make “a spiral” – with something like 5~6 turns. You may wish to use small hobby pliers for this. Note: the “short” end to wire, the one where the spiral ends – do not press it totally down to the surface area of the drill bit cylinder. Let it protrude slightly, so that it slightly “sticks out”, about a quarter of a millimeter above the surface of the cylindrical drill-bit. Between the individual turns of the spiral, please leave a small gap, somewhere around a quarter of a millimeter or so, between the successive turns / windings, so that there are small clearances, through which you can see the underlying surface of the drill bit cylinder. Take this spiral off the drill bit now. This spiral will constitute and ending of our resistor. If you used a 2mm drill (one of 1,95mm would be much better, but is “hard to get”), then slightly tighten up the spiral, by slightly applying more “twist”, so as to slightly reduce her internal diameter. You just made first screw-on “nut” ending, that shall constitute a connector for our resistor. Now “screw” this nut onto the end of the graphite rod, preferably the end which is blunt. The leading edge of our spiral, as we let it protrude slightly, will constitute now a stew-on-leading edge, and will make the process of screwing the spiral onto the graphite rod slightly easier. It is just slightly raised, the short leading end, which we deliberately left slightly protruding by a 1/4 mm, so now it is elevated and makes life easier in terms of “screwing” the spiral onto the graphite rod. This leading edge facilitates the “grabbing” of the cylindrical graphite surface of the rod and enables us to mount the connector on to the rod with a tight fit. Winding the connector onto the rod should be fairly easy, an without too much trouble. We are winding the connector on whilst holding the “long” end of the connector, so this action has a natural tendency to “loosen” the twist of the spirals. The “Screw-On” process involves a minimal amount of wear imposed upon the even surface of the graphite rod. We do this on purpose, so as to obtain a reasonably tight fit, that will give us good contact between the connector and the graphite rod – even prior to soldering. After screwing the first connector onto the rod, we start warming up our soldering iron – the power of which should be at a minimum 100 watts. The Soldering must take place in a fairly high temperature, and the power of the soldering iron should be high enough so as to heat up the bulky spiral and the rod inside it. As regards the solder itself, I use a 50/50 mix of two types of solder. The first is an old style Tin-Lead (Sn + Pb) solder, of a composition 60% / 40%, and the second solder is a Lead-free solder, but with silver content, of about 4% silver. You of course you also need a rosin soldering flux, liquid. It is best to moisten the entire end of the spiral. Pre-heat the spiral along with the entire end of the graphite rod within, to a very high temperature (as in comparison to ordinary soldering temperature standards). Apply the tin solder to such heated up spiral, taking special care that it PENETRATES into the GAPS between the windings, so that it is “sucked” in underneath the surface of the windings. WARNING: Hold the Graphite Rod in a protective glove. Graphite is a good conductor of heat, so sooner than later the whole rod will exhibit a significant temperature and you can burn your fingers, if holding it without protection. Although you only heat up one end of the rod, the heat will tend to flow over the entire length of the rod. Allow the Tin solder to penetrate directly into the gaps between the turns of the spirals. Apply the tin solder lavishly. Apply a lot of it. Just enough so as that id does not drop off from the “excess”. When the solder is still hot, highly liquid and floats around all over the spiral on the tip of the graphite rod, starts to rotate the horizontally around its own axis, in such a way that the tin is uniformly spread around the circumference of the spiral. Whilst rotating, the whole thing gradually cools down, the tin solder denses, and in the process it evenly deposits around the whole circumference of the spiral. 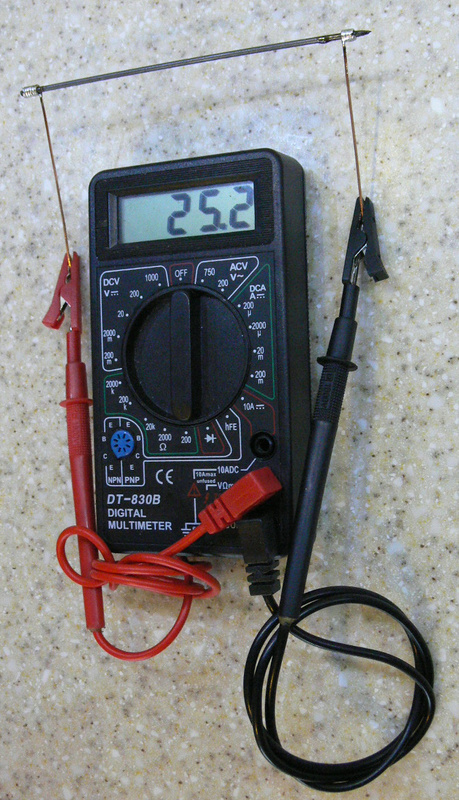 When it all cools down, prepare your Ohms meter, together with “alligator” clips so as to catch the one connector that is already mounted onto the resistor, as well as the other one, that we shall be dealing with now. When the tin solder cools down, down to room temperature, the whole spiral shrinks and tightens upon the solder that penetrated into the insides of the windings. When the spiral was hot, it actually increased it’s diameter and allowed some tin to penetrate “inside”. When it cooled of, it tightened it’s “grip” on the graphite rod, but also applied enormous pressure on the dense tin, that got inside, but as it now is dense, cannot escape. The cooling down of the spiral is the paramount key do a successful, highly reliable connection between our connector and the graphite rod. The spiral shrunk and tightened with a “strangle-hold” on the tin and graphite. The contact is very reliable and of a very high quality, albeit it is only “kitchen-table-DIY”. I have not yet experienced a single problem pertaining to an uncertain contact between the connector that the graphite rod. And believe me, for my own purposes, I made quite a few of these resistors. Before we start making the other connector, attach the crocodiles of your ohmmeter to both connectors. You shall be constantly monitoring the actual read-out DURING the process of screwing on of the second connector. What you shall now measure in terms of read-out, will tend to exhibit a slightly higher resistance than the one which you will obtain in the final product, after ultimately soldering on this second connector. This is probably due to a fairly poor contact area between connector’s spiral and the surface of the graphite rod. But do not worry about that. If we are producing, for example, a resistor of a target resistance of 25 ohms, I would “set” the srewed-on resistance to something like 26 ~ 27 Ohms. Now we solder this second connector, similarly as the first one. But, instead of rotating now, please rather with no necessary delay measure the “HOT” resistance. It will be different from the final “COLD” resistance. An interesting observation, as to how the temperature coefficient behaves of such a resistor. Now wait 10 minutes until **completely** cooled down to room temperature (I stress: ROOM temperature, and not “almost” room temperature. If it is Luke-warm, there will also be a difference ! ). Now, in such a cold state, measure with the ohms meter how much resistance you came up with. Is it OK? If so, great. But if, on the other hand, the resulting resistance is not what you are willing to accept, simply heat up the spiral again, from the sharpened side of the graphite rod and such a hot tin condition, screw or unscrew the spiral so as to correct the error, by a length that will be suitable to compensate the difference. If you wish to produce a “matched pair” of resistors, .. simply do so. When the second resistor is ready and cooled down, measure the resistances and compare the difference in results. Reheat the second connector of the second resistor and adjust in a hot state – accordingly. When the resistor cools down to room temperature – measure again and compare the degree of “pairing” of our resistors. If necessary – Warm up again one end and after reaching the state of liquid tin – apply the correction my means of rotational movements of the spiral (screwing / unscrewing) according to the needs and the magnitude of the required adjustment. For me, within my DAC there are two matched pair 280 ohm resistors, serving the purpose of a current-to-voltage passive conversion, directly behind the DAC chip. I am sure that I will NOT be exchanging those for anything else. For a long time. The only thing that I would probably now considering doing differently, is to make two “halves”: 140 + 140 ohms, so that both connector ends come out from the same side. so that I get rid of that extremely large loop (“antenna”) that is a side effect of applying a single long graphite rod, instead of two halves. For speaker crossovers, you would need needed resistances in the range of 1~10ohms (for the tweeters), therefore I would rather the softer graphite rods, 2mm in diameter, with a hardness grade in the range of 5B ~ HB, depending on your needs. Recently I saw that there are also 2mm rods available with an even higher hardness, mainly a grade of 10H … these I do not posses and did not measure, because when I bought graphite rods for my personal purposes, the 10H were not available at that time. So if some of you face a 10H rod, and make an “end to end” resistor out of it, please let me know via Email, what is the maximum possible resistance that can be achieved on a 10H rod. With the 9H rods that I used, the maximum limit is about 280 ~ 290 ohms. Has anyone actually dismantled a Duelund signal CAPACITOR ?